CBS news aired a video on tithing called “To Tithe or Not to Tithe”. It had interviewed both arguments from both sides of the debate. There recently was a story published by the Wall Street Journal, The Backlash Against Tithing, and i don’t feel that the WSJ did a very good job at all displaying the arguments for freewill giving. CBS news did a much better job. See the To Tithe or Not to Tithe video below. I watched the video and it was good. I love your video content I will try to have the guts to show one of them to friends who believe in the tithe. However people are so delicate on this issue. Cognative dissonance is so strong. Those abused by the tithe think that it must be true because I have given money to this cause. If they have been abused then they have been duped and it is so hard for somone to believe that they have been duped out of their money. Those who have collected the tithe feel even stronger. 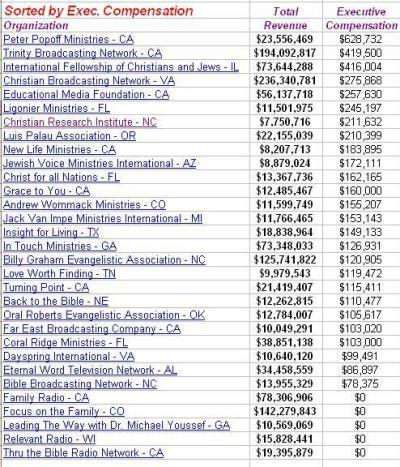 No way could I have spiritually abused my congregation for their hard earned dollars. All of the law was finished by Christ for us. Our favor and any good that comes to us is by His Grace alone and by His work on that Cross. Law keeping of Old Testament requirements have been fulfilled and replaced by free gifts and Grace! Christ redeemed us from the curse of the law so there is no way a blood bought redeemed child of God can be cursed for not paying the tithe. Gentiles were never given this do to in the first place and they always use Old Testament to try to force the tithing law. They have stolen the Lords glory and reward for the work he accomplished on the cross because of sheer ignorance or greed! God help them! The problem is that we are focussing on the word “tithe” and not “First Fruits” We want the best from God but we complain about giving him anything… We give the left overs… God is not focussed on your “tithes” he is more interested that you give him your best… “First things belong to God.” He gave his best and first, Jesus Christ. It amazes me how the wise of the world compain or attack an eternal principal… Someday you will face eternity; I’d like to see you argue Godly principles with the Almighty. You are assuming those who oppose tithe legalist do not give and are not blessed. No my friend who Are blessed and know what Paid in full means We know that God blesses us for free so we give with the right motive not to try to pay for what Jesus already paid in full for. We are freed from manipulations and fear of the Malachi 3:9 curse because Christ has redeemed us from the curse of the law, according to Galatians 3:13. Romans 8:32 declares that God with His his Son Jesus FREELY GIVES us All things. You are also assuming those who know their New Covenant of Grace (unmerited favor via the cross of Christ) do not give or that we are against giving. Anti-tithe legalist are not against giving. Just against forced giving using misquotes and Old Covenant law to scare people and guilt them into forced giving ten percent on every dollar, regardless to if they have income or not! Re-read Romans 8:32 God with His Son Freely gives us all things! God never asked for 10% of you money. Tithes was under the Law and it was never currency and Jesus redeemed us from the Law. Under the Law a person gave money as he was stirried in his heart or as he was willing. The New Testament teaches us in 2 Corinthian 9: 6-7. Every man according as he purposes in his heart so let him give, not grudingly or of necessity: for God loves a cheerful giver. This attitude of giving is found in the Old and New Testament. Pastors are Lying on God and the peple love it because their heart are not turned toward God but Pastors and money. To Gilbert how in the heck do you know that I am missing out on anything. I give abundantly and generously bu the word here is GIVE not PAY. I have a revelation of the meaning of GRACE and all that Jesus accomplished when he said Paid in full! I give the glory to his payment and my tithe payment! Galatians 3:10 ” All who rely on the law are under a curse, for it is written “Cursed is everyone who does not continue to do EVERYTHING written in the book of the Law. Everything includes circumcision and Sabbath keeping from Friday to Saturday night you had better not do anything but rest and pray! Galatians 3:11 ” So it is clear that no one can be made right with God by trying to keep the law. For the Scriptures say “it is through faith that a righteous person has life”. I give the glory to Jesus NOT my tithe payment. I left off the Not part! You should try it.